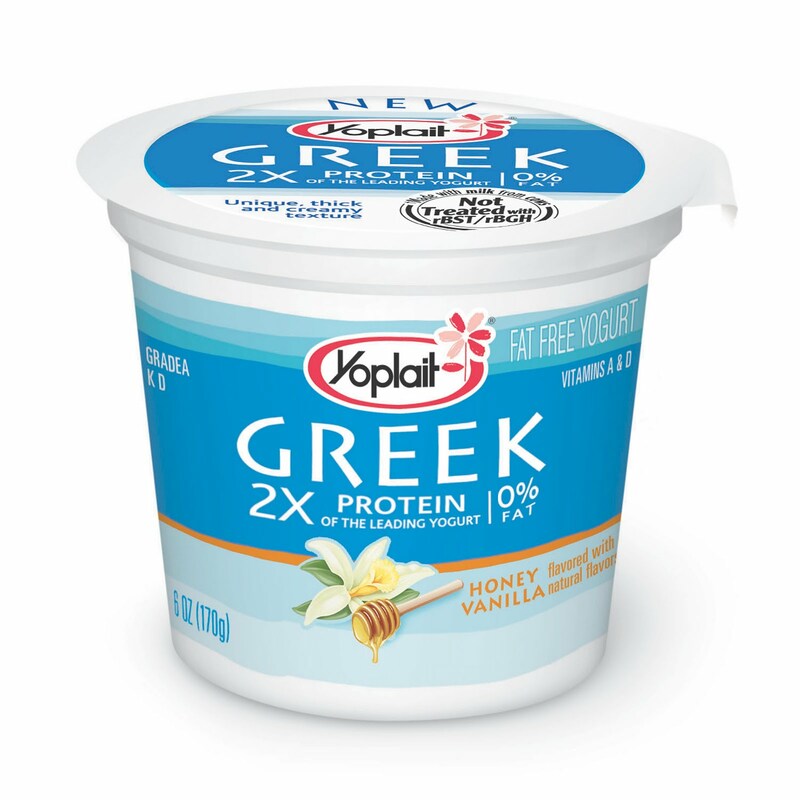 Yoplait yogurt now offers a Greek style yogurt with 12 grams of protein per container. To help "Nourish your Inner Goddess" Yoplait sent me one of these great packages and is going to award one to a lucky Dinner at Christina's reader! They are also offering a coupon to all readers for .30¢ off which can be downloaded here. I have yet to try the yogurt myself because I am having a hard time tracking it down! None of my local stores carry it and a phone call to the company showed only a handful of stores within 50 miles of my house ordering it within the last 90 days (despite the fact I'm 20 miles from the 3rd largest city in the United States!). I really want to try to Honey Vanilla flavor and will keep searching, though! Contest will run through midnight April 27th. Winner be announced April 28th. The "Nourish your Inner Goddess" gift packs and coupons for free yogurt were generously provided compliments of Yoplait and MyBlogSpark. I would love to try the blueberry! Great to know they offer this kind of yogurt! oooh im dying for honey vanilla! But I'm comment #2...#2 never wins! I would like to try the plain and the strawberry, since those are the flavors I eat in other brands. Ooooh honey vanilla sounds so good! Mmmm...plain with fresh blueberries and a drizzle of tupelo honey...heavenly! I wanna try plain. I'm a greek yogurt purist! Plain! Or honey vanilla sounds intriguing! This is a cool giveaway, I've wanted to try this new Yoplait greek yogurt, but I can't find it around here. I want to try honey vanilla - yum! I hope you can find it near you soon! I would like to try the honey vanilla, that sounds awesome! What a fabulous give-away package! While I do love blueberry, I would opt for the plain yogurt. I like to flavor the plain stuff myself to avoid the sugar. I'm thinkg plain and then blueberry-I hope I win! OOh! OOh! A free give-away! And I LOVE Greek Yogurt!! Can I get mine Plain (with) fat though? I always worry about extra sugar in the fat-free version. hands down - honey vanilla!! Happy Friday! I would love to try the plain to see how it tastes on a baked potatoe. The Honey Vanilla sounds best to me. Mmm I want to try the honey vanilla. Sounds so good! Greek Yogurt is my new obsession! I would love the win the Honey Vanilla! I'd love to try honey vanilla! I definitely want to try Honey Vanilla. I love Greek yogurt and would like to try the Honey Vanilla (if I can find it)! I would like to try the Honey Vanilla flavor...I bet it's great on it's own and would be a good addition to muffin and scone recipes, too. such a sweet giveaway idea! I just tried Dannon's Greek-style yogurt (plain) and mixed in granola and dried fruit. It was yummy. Thanks for the coupon btw :) can't wait to try it! I'd like to try strawberry! I'd love the honey vanilla, thanks! I would love to try the Strawberry one! Hands down, honey vanilla. I love honey in my yogurt anyway, and Greek yogurt is amazing. I'm with you, honey vanilla. Definitely honey vanilla! Sounds yummy! I'm gonna try it out! I'm a blueberry fan! That terry set looks heavenly, too. Hi! I love this giveaway! I would like to try the honey vanilla, sounds really good. I would like to try the Strawberry Yoplait Greek yogurt! I found it at Super Walmart, but didn't buy it because I forgot my coupon! I'd love to try the honey vanilla! Yum! I would like to try honey vanilla. I'd love to try the strawberry yogurt! i'd try the honey vanilla! yum yum! Can't wait to try the honey vanilla. Thank you for doing the giveaway! I'd love to try the honey vanilla. It's new at our local grocery store as of last week! i'd love to try the honey vanilla or just the plain! The strawberry sounds good to me. I'd like to try the honey vanilla. Looks like I just found another blog to follow! Honey vanilla sounds yummy. Thanks for the giveaway. cindyhinckley at msn. I would love to try the Strawberry!! I'd love to try the Honey Vanilla flavor! Thanks! !